On Friday, November 16th, at 7:00 pm join Swedish-American author Lars Nordstrom at the Cedar Mill Library. Lars will present a fascinating journey through the Swedish history of the state of Oregon from the 1800s into the 21st century. 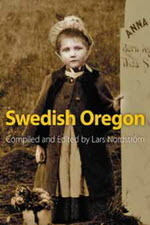 Lars has compiled wide-ranging material, some of it never before translated into English, for his book Swedish Oregon. Complementing the program will be a collection of Swedish immigrant artifacts on display through the month of November. Swedes began filtering into the Oregon Territory with the first wave of white settlers. At first their numbers grew slowly, but after 1883, when the railroad connected Portland to the national grid, the flow accelerated. By 1910, the Swedes were the second-largest foreign language immigrant group in the state.